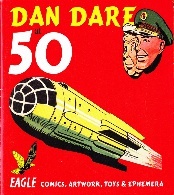 In 2000 Dan Dare and Eagle reached the age of 50, an occasion which was marked in many ways: a plaque was placed on the house in which my father was born in Audenshaw, Manchester, another on the first Dan Dare studio, the Bakery in Churchtown, and a third on Bayford Lodge, Epsom, which had served both as the Dan Dare Studio and our family home. 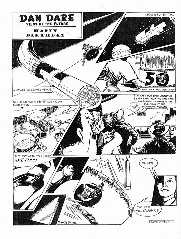 The Cartoon Museum in London organised an exhibition of artwork, as did the Atkinson Art Gallery in Southport. 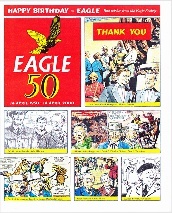 But the most fulsome of all the tributes paid were those of the Eagle fans. 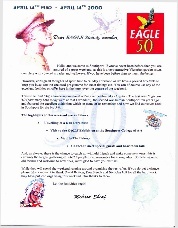 The Eagle Society organised a fabulous three days of events, ceremonies, speeches and dinners in Southport, the birthplace of Eagle. Guests included Chad Varah, Don Harley, Greta Tomlinson, Marcus Morris' three daughters Sally, Kate and Jan, and my father's sister Margaret as well as many Eagle fans. 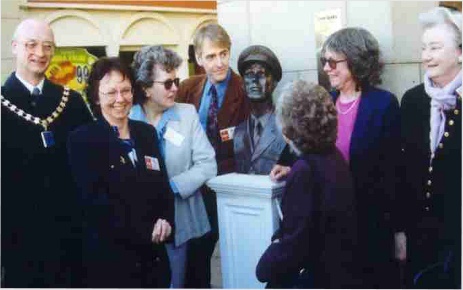 My wife Sue and I were pleased to be included in this whirwind of activity, the highlight of which was the unveiling of a bronze bust of Dan - commissioned and funded by the Eagle Society - in Southport Town Gardens, by the Morris sisters and myself. 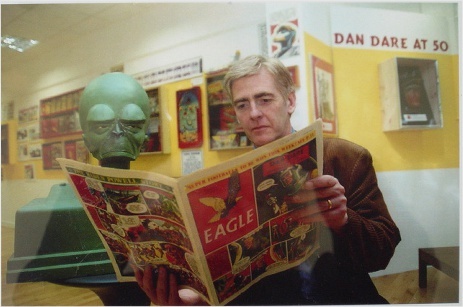 Such tributes would certainly have delighted both of the founders of Eagle and I know that my father would have been particularly touched and gratified to know that in the hearts and minds of his fans, Dan Dare remains the indestructable hero of their boyhood.